The X-Files: Gillian Anderson Quits! If The X-Files continues beyond Season 11, it will be without one of its two leads. There have been rumors for months now that Gillian Anderson was gearing up to bid farewell to the iconic drama series, and now the rumors have become a reality. "I've said from the beginning, this is it for me," the actress confirmed to TV Guide Magazine. "I was a bit surprised by people's [shocked] reaction to my announcement… because my understanding was that this was a single season." "So many seasons, so many shoulder pads, so much emotion! #TheXFiles." While Fox has yet to order more of The X-Files, it would be a no-brainer for the network. The X-Files Season 10 averaged 9.5 million viewers and a 3.2 rating among adults 18-49. 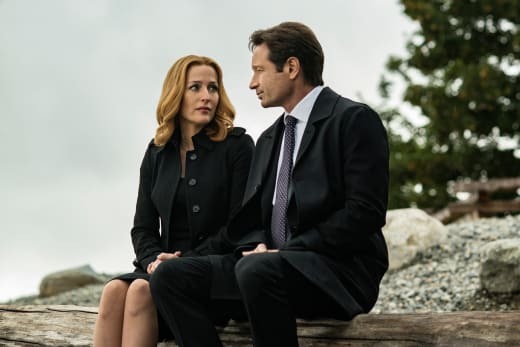 The X-Files Season 11 could emerge as Fox's highest-rated series, and the network would likely want to keep it around for more mysteries. Anderson has played the role of Dana Scully opposite David Duchovny since 1993. The original series concluded in 2002 and was followed by a feature film titled The X-Files: I Want to Believe in 2008. Fox revived the series back in 2016, but The X-Files Season 10 was met with a mixed reaction from critics. Thankfully, we've watched the first five episodes of the new season, and it sets the stage for a return to form for the series. You can read the full review here! What do you think of this news? Should the series come to a close after Season 11 or would you like it to continue with a new co-lead? Remember you can watch The X-Files online right here via TV Fanatic. Get caught up! The X-Files returns Wednesday, January 3! Mulder: Air's gettin' a little hot in here. O'Malley: Oh. Those don't roll down. I had the vehicle bulletproofed. Mulder: Because you never know when a gun-toting liberal might go Hinkley. Permalink: Because you never know when a gun-toting liberal might go Hinkley. Scully: I'm always happy to see you. Mulder: And I'm always happy to find a reason. Permalink: And I'm always happy to find a reason.